The Alaska World Affairs Council is pleased to offer a variety of programs to engage Alaskans with the world through informative dialogues. Below are key areas of programmatic focus. Please visit our listing of upcoming programs for registration information or contact us to learn more. Throughout the year, AKWorld offers luncheon and evening programs that are open to the public featuring world-class experts on a diverse range of topics. These programs include single-speaker forums as well as panel discussions and story nights. Each program includes a Q&A session toward the end, allowing participants to respectfully pose their questions directly to our featured speaker(s). These programs are typically hosted at 49th State Brewing Company in downtown Anchorage or at Bear Tooth Theatre in midtown Anchorage. To help reduce the barriers for participation at downtown programs, we have partnered with EasyPark Alaska to arrange complimentary lot parking for attendees who pre-register for programs via our online system. At public programs, there are often opportunities for students and military personnel to receive complimentary admission thanks to support from generous community sponsors. Specific information about and registration for upcoming programs can be found here. AKWorld’s programming for students allows us to cultivate curiosity about the world in Alaskan youth. From our annual Academic WorldQuest competition that challenges high school students to become semi-experts in key areas to our Speed Mentoring event connecting students to professionals in careers with international ties, we seek to expose students to the wide range of opportunities that become available with global perspective. Thanks to long-standing support from community sponsors, we are able to make our programs and amazing speakers accessible to students. Featured speakers often visit students in their school classrooms, bringing their unique expertise directly to the students. Individual students and classroom groups are also invited to attend public programs at no cost to themselves allowing for prime community networking experience and top-notch global education. Students interested in participating in public programs should register via the “Student Admission” ticket option available on each program page. 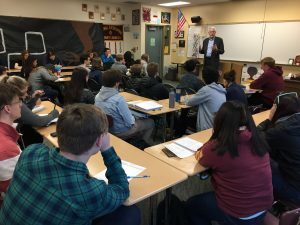 Teachers interested in hosting visiting speakers or bringing a class group to a public program should contact Program Director, Rachel Williams, at programs@alaskaworldaffairs.org for information. A special benefit we make available to our valued members, donors, and sponsors is the opportunity to engage speakers in conversation in a small-group setting. 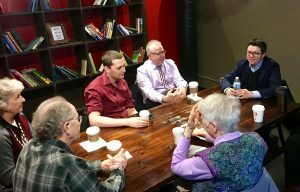 Whether it is over coffee or dinner, we arrange for select speakers to meet with these groups of less than 20 individuals to share a deeper dive into the speaker’s expertise that may not be possible in a larger setting. 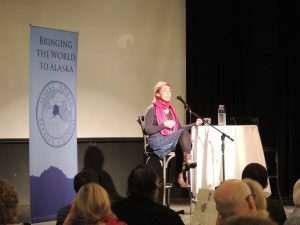 For more information about special opportunities to meet with speakers, contact Development Director, Linda Shepherd at membership@alaskaworldaffairs.org.